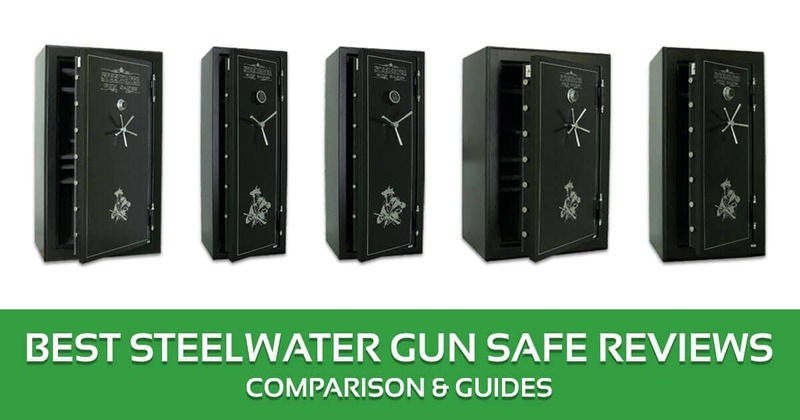 Are you looking for Steelwater gun safe reviews? This article will get you in the know about Steelwater and its various gun safe models. 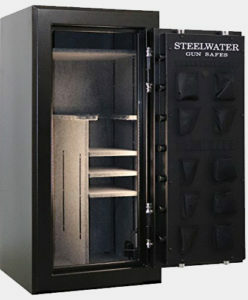 Steelwater is known for its good quality but very affordable gun safes. Many gun owners who have owned a Steelwater safe say the company has reliable, well-made, and low-priced offerings. Most Steelwater safes are also fire proof. Its safes also get good feedback for being easy to install. Perhaps another advantage of Steelwater safes is that it is rare for the company to make mechanical changes. Thus it is very easy to find replacement parts for a Steelwater safe even if it is old. 6 Where are steelwater safes made? The five gun safes in this article are all fire proof, which is a common trait of gun safes from Steelwater. Aside from being fire proof, the safes discussed thoroughly in this article have removable shelves. This will prove to be an advantage to you, as you would be able to remove or add shelves depending on your storage requirements. These gun safes are also designed to resist drill and pry attacks. I highly doubt that burglars will be able to open these safes. The number of weapons that you can store in these safes varies, however. Some are spacious enough to accommodate more than 30 long guns while some can only be for storing less than 20 weapons. In terms of price, I can say that these safes are reasonably priced. In fact, these five models are comparable with more expensive safes in terms of quality and features. Keeping your gun in a secure safe gives you some peace of mind. How will you determine the right type of safe to buy? There are so many different safe brands such that it can be confusing to find what suits you best. Steel water is one of the best companies providing durable and affordable safes. I will cover a few important things about steelwater gun safes that you should know. I have also recommended some of the best steelwater gun safes that will be perfect for locking your gun. It is tricky to choose a suitable gun safe. This is why you should take your time to sample a variety of gun safes. With these reviews below, you will definitely settle for your suitable gun safe, no more gambling with your money buying gun safes that will not keep your guns secure. Go through these reviews of steelwater gun safes before buying one. This is a safe that I can recommend if you are looking for a gun safe that is sturdy, durable, big, but won’t break the bank so to speak. It is a fire protection gun safe that has a mechanical locking mechanism. Yes, you may need some time to get used to it but I can assure you that it is quite reliable. The firm also offers to upgrade to a digital lock, although that comes with a significant fee. This safe is ultra heavy at over 888 pounds so I highly doubt that burglars can move it. Its door and frame is quite strong and durable as well. Plus it looks good and definitely not cheap. Despite the low price of this safe, you’d know that Steelwater didn’t scrimp on the materials. It is made of 12 gauge steel plus there’s an extra quarter of an inch steel plate on the entire door. The paint job is also well done. Simply put it, I was impressed with the build quality of this safe. Build quality is basically useless if there are not enough security features in the safe, right? Fortunately, this safe has a decent number of security features. It can resist punch, pry, and drill attacks with its gear driven lock and bolt system. Then it has a double sided, U-channel steel reinforced top long shelf that can prevent breakage and warping. Let’s just say you won’t have to lose sleep when you are away from home if you buy this safe. When you open the safe, you will see a two section gun rack. I think you can put around 10 to 11 long guns inside this safe. There are four shelves inside that can be removed as well for additional storage. The interiors are fully upholstered so you can be assured that your weapons are well protected against scratches. The company also throws in a dehumidifier for free. If there’s something conspicuously missing, then it has to be an interior light. But for its price, build quality and security features, this safe gets high marks. This gun safe is advertised to be capable of storing up to 22 long guns. I have some doubts on that claim but I can’t dispute the fact that this safe is well constructed, reliable, and affordable. Like the other Steelwater safes mentioned in this list, this safe gets high marks for its built quality. You won’t get that feeling that you were shortchanged when you first see this safe. To start with, this safe is made of reinforced steel. The top long shelf has steel shelf clips designed to prevent warping and breaking. There’s an extra steel plate welded in the front door that further makes this safe burglar-proof. When you open this space, you will be greeted by its fully upholstered interiors. There is a two section rack where you can place your long guns. Steelwater claims that you can place 11 long guns in each rack. I found that too be a bit overkill as in my experience, and both racks can only accommodate 8 to 9 long guns. Still, the fact that you can remove the shelves means you can put handguns and small weapons inside the safe. I also like that this safe has a couple of spare bags and pistol bags. The manufacturer also throws in a bonus dehumidifier for good measure. This safe is also constructed to resist fire for up to two hours at a max temperature of 1875 degrees Fahrenheit. This safe has satisfactorily met the standards set by the California State Department of Justice. Many reviewers on Amazon.com describe this as a beast of a safe, and I agree with them. The safe weighs more than 1,000 pounds thus you will need all the help you can get in installing this unit. The hard plate is tough that it can resist drilling. It can also protect the lock as well as the gear drive and other vulnerable areas of the safe. I’m confident that burglars will have a hard time forcing their way into this safe. They will really need lots of time if they want to get access to your weapons. This is a solidly built safe that can accommodate 12 to 16 long guns. What I like about this safe is that it has a double locking system so it is highly unlikely that you’ll get locked out of this one. This gun safe has an electronic locking system as well as an emergency bypass key. With this set-up, this Steelwater unit can give you peace of mind knowing it’s almost impossible for you not to access your weapons. Others point out that this unit isn’t as heavy as other safes. But make no mistake about it. you will still need some help in lifting this safe to the area where you want it installed. Let’s look first at the electronic locking mechanism of this safe. There’s a chrome digital keypad in front of the door. You can input three to eight digit user codes in this keypad. Now in case you can’t remember your codes, you can use the emergency bypass key to open this safe. When you open the door, you will see two gun racks inside the safe. The left side is where you can put your long guns. According to Steelwater, you can put as many as eight long guns in the left side. The right side can also accommodate that many weapons. However, the right side also has removable levels. You can add or remove those according to your storage needs. There is also a spacious shelf on top of the safe, where you can place other valuables such as jewelry box, scopes, ammunition, and even cash. Like the other safes discussed in this list, the interiors of this safe are upholstered. You can also sleep soundly at night knowing that it is almost impossible for burglars to access this safe. The hard plate is drill resistant. The safe also makes use of Steelwater’s gear drive system that can resist pry and punch attacks. Burglars have to be as strong as Superman in order to open this safe. Finally, this is less than 500 pounds in weight. I know it is still impossible for one guy to install it; but with the aid of a friend or so you should be able to do so. This safe is something I can recommend to gun owners who have 8 to 10 long guns. While Steelwater says it can store up to 16 long guns, I’ve seen a lot of reviews contesting that claim. Still, this safe is a good choice if you’re on a budget and you have a limited number of weapons. Like the other Steelwater safes, this model is fire proof. This safe should be able to resist fire as long as it doesn’t go past the 45-minute mark. It has also passed the standards set by the Department of Justice of the California State. I also like that this safe is equipped with an electronic locking mechanism. This safe has a hard plate that is drill and ballistic resistant. It’s also more difficult for burglars to open this safe as it has a spring loaded, re-locking bolt in the event that the lock is removed. 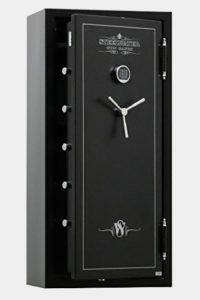 This safe has a black finish that gives it a very attractive look. It is also not that heavy at around 300 pounds. I also like that the door of this safe is built to endure pry and punch attacks. In fact, the door is so heavy that it can tip over unless you secure it to the ground. As mentioned earlier, this safe makes use of an electronic locking mechanism. You can input 3 to 8 digit user codes in this keypad. In case you forget your codes, you can then turn to the double bitted emergency bypass key of this safe. With the double locking system of this safe, there is a very low chance that you would get locked out. Like what I said earlier, this safe will only be able to accommodate around 8 to 10 long guns. A friend who bought this safe stores two AR-15, two shotguns, and two rifles. He also puts a couple of scopes and several pistols. He doubts, too, that this safe would be able to take more than a dozen guns. There are three removable shelves in this safe. Then there’s a top shelf where you can put your other valuables like ammunition, scope, cash, and jewelry box. This has enough room for 10 long guns. Its shelves are removable, so you can add or remove shelves depending on your storage requirements. It makes use of a digital locking mechanism. With a back up key, you won’t be locked out of this safe. Are you looking for a quality gun safe to lock your long gun? 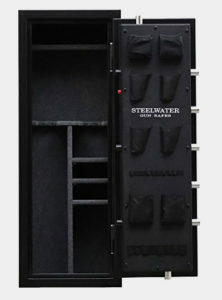 The steelwater gun safe is a secure gun safe and suitable for keeping long guns. This safe features an interior that is fully carpeted to ensure that your valuable items remain in the best condition inside the safe. Below are features that make this gun safe a gun safe you should consider purchasing. It can withstand fire of 1550 degrees for up to 45 minutes. Not just the regular gun safe that will get burnt and destroy the guns inside. With the 45 minutes of a fire accident, probably the fire will be extinguished, or it will not be that hot to burn the gun safe. The interior capacity of this gun safe is large enough even for storage of your large guns. The interior is also made into shelves that enable you to store several guns into position. The interior dimensions measure 55 ¼inches by 19 ½ Inches by 9 ¾ inches. Space is large enough to store up to a maximum of eight long guns. The shelves are also removable, which can be added to create space for storage of short guns. The body of the gun safe is made of steel. The door seal is heat activated and expands up to 8 times its original size just in case of fire. The seal prevents entry of smoke and water into the safe. The safe has got a three-way direct drive lock and a superior bolt system. In case unauthorized people attempt to access the guns by removing the lock system, the internal spring loaded re-locking bolt keeps your gun safe. The thickness of the walls of this gun safe ensures that your guns are even safer. The gun safe should be fixed to the floor by use of the holes and bolts provided, to boost safety. This is another feature that makes the safe secure for storing your valuables. In case of fire outbreak, the door seal expands to prevent heat and smoke from reaching the inside of the safe. It has a thick door of 5”, boosting safety even further. Superior digital lock system that cannot be easily accessed by unauthorized persons. Good looking and nicely finished. Protects your guns from natural hazards like water, fire, and smoke. The gun safe is huge and heavy making it not easily portable. The Steelwater AMSWD is a nice selection for people who want a safe to keep documents, guns and other valuable items. The safe combines a dual locking security system to assure you of the security of your items. The superior qualities of this gun safe guarantee you to keep your guns secure. When there is fire in your home, chances of losing important documents and other valuables is high if you do not have a safe. This safe can withstand a fire of 1010 degree Celsius for up to two hours! Your gun is therefore protected in case fire breaks out. The body of this gun safe is made of two layers of steel. It is designed with a thick which prevents burglars from accessing your gun. 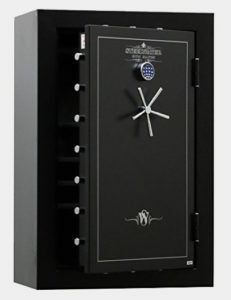 Even if they try to break the safe, it is almost impossible because of its quality construction. The most important aspect of any gun safe is the locking mechanism. After all, do you want a gun safe that every person can try to unlock? The lock system of the safe is superior and cannot be unlocked by any unauthorized persons. It uses both combination and high-security dual locking systems. And for you to open the safe and access the contents, you have to open both the two locking systems. Ample storage space for your guns with some removable shelves. Carpeted on the interior to keep your guns safe from scratches. The combination of lock system makes it complex and slow to open the safe. This can let you down while you are trying to access your safe during an emergency. If you want to protect important items in your house from theft, fire or unauthorized access, investing in a safe is a great idea. You can try the Steelwater AMSWD-360 which is designed to hold short guns, documents and other small items that you want to keep secure. The body of this gun safe is strong because the walls are thick and made of layers of steel. The door of this safe is even thicker. The strong construction makes the safe breakroom in case buglers try to break it. It has a superior locking system that comes with two keys. They have two rectangular locking bolts. You can be sure that no unauthorized person can unlock the safe and get away with your valuable items. Before you purchase a safe, it is great if you consider the fireproof rating. 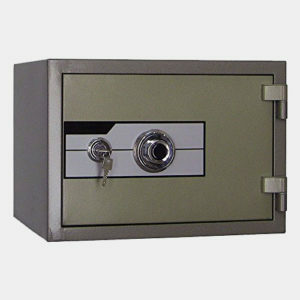 This safe is fireproof and can sustain fire of up to 1010 degree Celsius for two hours. They have a two-wheeler that will help you move it around. Ample space for storage of your guns. The storage shelves are also removable. If you have around 30 long guns and you want a fire proof safe that’s budget friendly, this is the model that I can recommend. Just as what you would expect from Steelwater safes, this one is fireproof. It is also designed to resist pry and drill attacks. Like the other safe, it has removable shelves. You can remove those shelves in case you need to put more long guns inside. This is a safe that passes the standards set by the California State Department of Justice. You’ll have peace of mind knowing that this safe can protect your weapons against determined burglars. This safe is designed to withstand fire at a maximum temperature of 1875 degrees Fahrenheit. According to Steelwater, this safe can endure up to two hours of fire. The safe also has a door seal that expands when there’s fire. This is designed to seal out the heat and water during a fire. Apart from being fireproof, this safe is built to resist pry and drill attacks that burglars often perform. I believe it would take a really determined and strong burglar to be able to open this safe. It has a gear driven lock and bolt system that can make it doubly harder for criminals to get access to your weapons and other valuables. When you open the safe, you’ll see a top shelf where you can put accessories such as scopes and ammunition. The lower part of the safe has three sections with the middle area spacious enough for long guns. The left and right sides have removable levels. So if you need more space for other long guns, you cam remove those levels. Both sections can accommodate around 10 long guns. The middle area also has the same capacity thus you can put 30 long guns inside the safe. The interiors are also upholstered thus your weapons won’t likely get scratches. Given the size of this safe (nearly 700 pounds), you will definitely need some professional help. But it has all the mounting hardware you need just in case you install it with your pals. Steelwater gun safes are a great addition to any home with guns. You’ll want them to protect your firearms from a wide variety of dangers. If you’re hesitant about buying that Steelwater 16 gun safe, here are a few reasons why you should. Steelwater gun safe reviews often talk about how affordable these gun safes are. A lot of people then expect that they have this price thanks to Steelwater being cheap. The truth is Steelwater didn’t scrimp at all. What you’re getting for your payment is top dollar material for the price range. Some of these gun safes are in the 12 gauge and 14 gauge steel range, but that is still pretty good protection for your guns. The real star of any gun safe is its locking mechanism. The usual Steelwater gun safe lock is a digital one, requiring the input of your personal combination. This digital lock has a couple of interesting features. The first one is its EMP resistance, ensuring that your gun safe will open even in emergencies. The second is the fact that the digital lock has a back up. If it is ever knocked out, a relocking mechanism activates to keep your guns even safer. Besides the great lock, Steelwater gun safes can resist fire very well. Even the lowest grade can handle a hot fire for 45 minutes without any damage to its contents. If you want to avoid any Steelwater gun safe problems, it is best to do regular maintenance on your safe. It also helps if you know how to use it properly and take advantage of some of the accessories that Steelwater offers. In the Steelwater gun safe vs Liberty gun safe debate, these two companies are about even on the matter of accessories. Steelwater offers a complete set of accessories on purchase, for a minor addition on the price. An essential accessory you need to add is a dehumidifier. This ensures that only dry air circulates inside your safe, reducing the chance of any parts developing rust. Another accessory you may want to buy getting an additional emergency bypass key. This stops you from losing access to your guns in case you forgot your code or combination. A safe is pretty durable, but you still need to take care with it. Improper storage and careless use can end up damaging it. For example, you want to close and lock the door solidly but not harshly. This ensures that the locking mechanism catches, but with no damage to it. This should extend the lifespan of your safe greatly. There are three things to do when maintaining a Steelwater safe. First, you will need to clean it regularly so it won’t develop rust. Second, you will want to oil its door hinges at least once a month. This ensures smooth opening and closing. Finally, electronic door locks need to have their batteries replaced when they get low in charge. Take note of how long you have been using a battery to have a replacement ready. Roman was not built in a day, just like the steelwater brand safe started small and gradually grew to become the trustworthy gun safe company it is today. The founder of the company joined law enforcement right after completing his high school education. He spent five years in Law enforcement, a moment he came to learn that most gun safes were not performing their duties as expected. Since a business should be started to solve an existing problem, he decided to found the steelwater gun safes brand. He started the brand and has an experience if over two decades in manufacturing quality gun safes. Where are steelwater safes made? All the steelwater gun safe products are designed in North Augusta in South Carolina. They then undergo the processing in a factory in the Peoples Republic of China. Both steelwater safe and liberty safe protect the gun and other contents in the safe from fire and burglary. Steel water further protects the gun contents from other natural hazards like water and smoke, unlike the liberty gun safes. The liberty gun safes are easily portable and you can move with them around, unlike the steelwater gun safe that tends to be a little heavier. 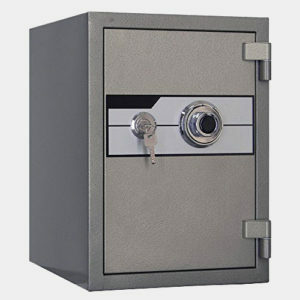 Both safes are made of a strong steel body. Both can be accessed by mechanical and electronic lock systems. Steelwater gun safe has the ability to protect its contents from long exposure to fire unlike Winchester gun safe. Unfortunately for those who want to buy USA, Steelwater manufactures their safes in China. There are different gun safes available from Steelwater. They literally have every gun safe possible. Their smallest is a pistol safe for handgun owners. The biggest they have can handle up to 25 long guns. How Long Can a Steelwater Gun Safe Resist Heat? Depending on which model you have, there are different times for heat exposure. Their extreme heavy duty model can handle a two hour fire without damage to its interior. This is thanks to the two layers of fireboard in the interior. It is also because of the heat expanding door seal, which blocks out smoke and water when the exterior reaches a certain temperature. How Do You Install These Safes? Installing these safes will take professional help. Fortunately, Steelwater provides professional installers to secure these safes into your home properly. If you need to move the safe, you’ll need to contact Steelwater again for some help in the transfer. Should I get a Combination Lock or a Digital Lock? It depends on what you think is more dependable. Each has their own advantages and disadvantages. Combination locks do not need power sources to operate. However, a lot of people know how to crack them. Digital locks are harder to crack. However, they will need regular maintenance. Now you may ask, what is the best safe in this list? It is a tough call but I would say that the Steelwater Heavy Duty 20 Long Gun Fire Protection. What I like best about this gun safe is that it has a double locking mechanism. In the event that you forget your code, you can turn to the emergency keys. Moreover, the fact that this safe can store more long guns than the Steelwater Heavy Duty 16 Long Gun Fire Protection (which also has a dual locking system) gives it a clear advantage over the other model. But whether you go with the Steelwater Heavy Duty 20 or another model, I can assure you that you won’t regret buying a Steelwater gun safe. What is the Most Accurate Reloading Press for the Money? I love guns and am a great champion of the Second Amendment. Keeping my growing collection was becoming a challenge and I hit the road looking for the ideal safe. I was impressed by the Steel water Heavy Duty 45 Long Gun Fire Protection Review given the fact that I needed a fireproof heavy duty safe that could handle a few guns.